Hi, I am interested in your 1980 Chevrolet Corvette (stock #4654-ATL) listed on Autotrader for $18,995. I'd like to get more information about this vehicle and confirm its availability. There cant be many car guys who havent lusted for a black Corvette at some point in their lives. 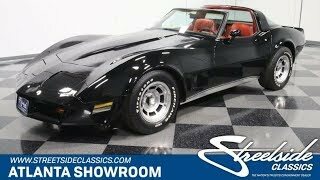 This great-looking 1980 example is a fantastic way to break into the Corvette hobby for not a lot of money, and youll probably discover that its a lot of high-performance fun for your dollar. You simply cant go wrong with slick black on your fantastic fiberglass. This one still wears its original color combo, recently refreshed and showing extremely well today. Although finished to a higher level, its not a trailer queen and can be enjoyed without having to worry about rain or bugs on the finish. By 1980, build quality had improved by leaps and bounds, so youll find good gaps, neat-fitting bumper caps and headlight buckets, and T-tops that seal up well. T-Tops, simply a great way to further sport-up a C3. With an update in 1978, the fastback profile with aggressive front and rear spoilers is as good as the C3 got, and its instantly recognizable today. Unlike a lot of Corvettes of this period, this one hasnt been dressed up with aftermarket add-ons, pinstripes, or other nonsense that purists reject; its just a very clean, original Vette. The beautiful code 722 red leather interior is pure 1980s cool and we like the contrast a lot more than plain old black or bland oyster. With a comfortable look thats quite inviting, its hard to resist sliding into those deep buckets and looking out over that long, dramatic hood. The seats show slight wear thats frankly so minor that its not commensurate with the cars age and mileage, while the rest of the interior is very well preserved with only minimal signs of use. And take a look at that rare wood grain on the center console; makes you want to read a leather-bound book and enjoy a single-malt after your trip, no? Corvettes were loaded with standard equipment in 1980, including A/C, power windows and locks, tilt wheel, and a complete array of gauges that are highly visible and easy to read. An AM/FM/CD/iPod compatible head unit is neatly fitted in the center stack, so make a few trips to garage sales and see if you can outfit it with some kicking 80s sounds! The A/C has been upgraded to R134a refrigerant (needs to be serviced), but thats really the only other major deviation from original spec. Dual snorkels on the air cleaner suggest that this is an L48 engine, and it is indeed this cars original, numbers-matching powerplant. With 190 horsepower, it was a fairly stout performer in 1980, and even today the solid whack of torque will get your heart racing on the street. It starts quickly and idles easily thanks to careful maintenance and conscientious ownership throughout the years, keeping it in top mechanical condition. Its topped by a Rochester 4-barrel carb, stock exhaust and intake manifolds, and has been upgraded to an HEI ignition system. The engine bay is clean and well-maintained, and items like the air cleaner lid and valve covers remain in excellent shape. The TH350 3-speed automatic transmission shifts crisply and the power 4-wheel disc brakes and power steering contribute to a fantastic driving experience. The original slotted alloy wheels look great and wear fat 255/60/15 Firestone Firehawk performance radials. This car represents a great opportunity to get into the Corvette hobby at an awesome price. Numbers matching, a slick black paint job, and an awesome performer, this C3 wont last long. Call today!